For all the talk about the "magic of opera", really successful performances are so rare that dedicated operaphiles have grown accustomed to waiting long - and travelling far - in search of a sublime theatrical experience. Productions and performances that succeed in creating the illusion of a believable parallel world (even for a few minutes, let alone a whole evening) are the exception to the rule. For every minute of Art we endure countless hours of pretentious, banal, incompetent singing and acting. But when that transcendental moment occurs, the floodgates of feeling open. One’s patience is rewarded and life suddenly seems worth living. 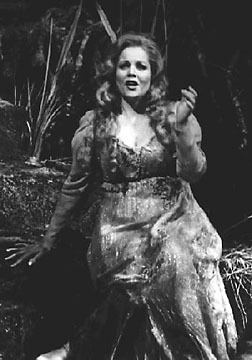 Renée Fleming’s performance in the title role of Dvorak’s Rusalka at the Metropolitan Opera on May 10, 1997 was one of those life-affirming artistic experiences. Rusalka is a water-nymph who trades her immortality for the chance to win the love of a human prince. Rusalka is difficult role to cast because few of the vocally qualified lyric sopranos possess the physical grace and delicacy for the part. Fortunately Renée Fleming not only has the voice but is blond, svelte, and feminine. She is also a completely convincing natural actress. Rusalka’s movements once she leaves her water-world are limited to a sort of swimming through the air. Costumed in a gauzy iridescent blue gown, Fleming’s slow, amphibious movements perfectly conveyed Rusalka’s mute struggle in a strange element. The climax of Fleming’s Kabuki-like gestural theatre occurred in the last moments of Act III when Rusalka rises from the pond to meet her prince and watch him die. Fleming seemed to walk on water and float through the air on this, her final, saddest errand. Of course the highlight of the opera was Rusalka’s "Song to the Moon." I have never seen a Metropolitan Opera audience (especially a matinee audience!) so spellbound. The initial respectful silence was soon broken by sobs of uncontrolled emotion. We were all crying though we fought it because we didn’t want to miss a note of Fleming's gorgeous lyricism. Resistance was impossible. Fleming's art made Rusalka’s plaint personal. Father, brother, lover, son - clearly everyone in the audience remembered a prince loved or a prince lost. Fleming’s Rusalka is obviously the product of consummate artistry and hard work. Though this is her first Met Rusalka, she has sung the role in Seattle (1990), Houston (1991), San Diego and San Francisco (1995). In addition to her personal beauty and fine acting, Fleming possesses the most beautiful soprano voice I have heard in a decade. It is womanly, with an ingratiating timbre, pure yet personal, technically capable of the subtlest nuances with a reserve of great power. The rest of Dvorak’s opera after the "Moon Song" is charming but inevitably a bit anticlimactic. Fleming continued superb. Sergei Koptchak, a great Russian bass with remarkable pianissimo, was dramatically and vocally haunting as the Water-Gnome. Mezzo Dolores Zajick’s Jezibaba was comical and intellectually frightening by turns. Canadian soprano Frances Ginzer was good in the small role of the Foreign Princess. Only tenor Chris Merritt fell short of the mark, forcing unpleasantly in order to project and to hit high notes. Conductor John Fiore coaxed a delicious performance out of the orchestra, who were remarkably fresh considering they’d played Wagner all week. The production, acquired from the Vienna State Opera and first seen at the Met on November 11, 1993, featured naturalistic sets by Günther Schneider-Siemssen. The prince’s castle was charming. Unfortunately the pond inhabited by the Gnome and nymphs was obviously just glittery fabric stretched across a hole in the stage, and the tree Rusalka inhabits beside the pond should be reinforced and oiled - it creaked audibly throughout the opera.